Prime Minister Stephen Harper has announced a new mission for Canadian Forces to train Ukrainian soldiers and military police. 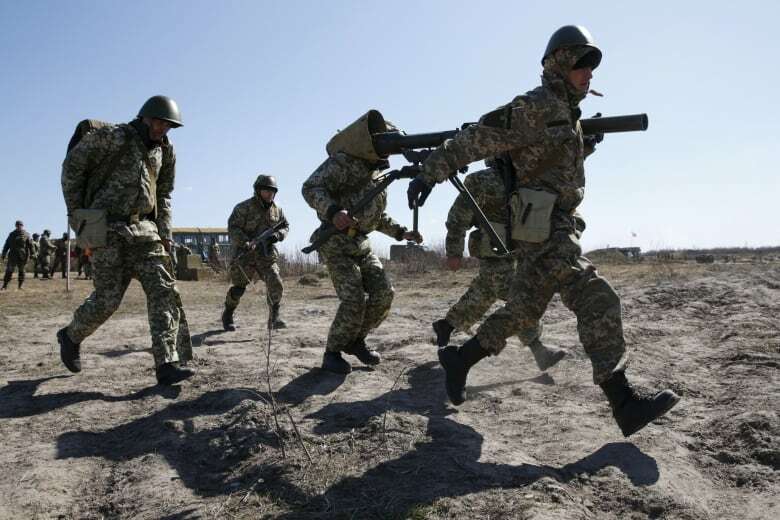 About 200 troops will rotate in and out of various training roles in western Ukraine over the next two years. Canada will join a training mission to help Ukraine's military in its struggle against Russian-backed rebels, Prime Minister Stephen Harper said Tuesday, following months of requests for assistance from Ukraine's government. Starting this summer, roughly 200 troops will be deployed, until March, 2017, to help develop and deliver training for Ukrainian forces personnel. 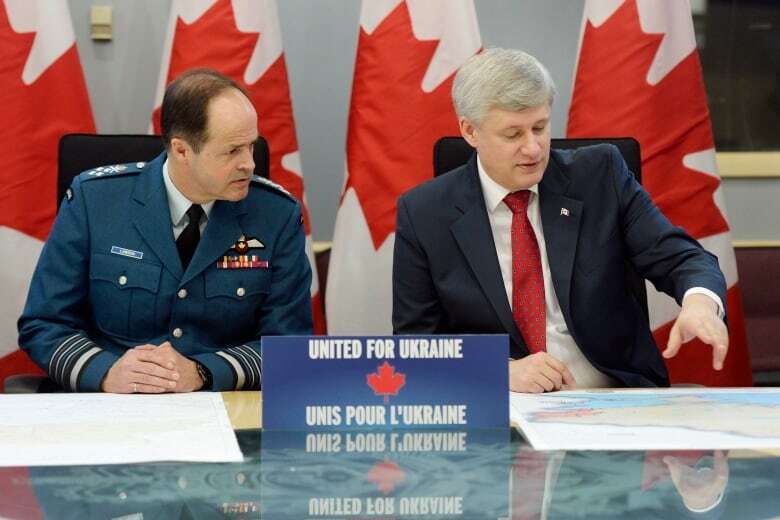 Ukraine: Should Canada push the West to provide weapons? Harper made the announcement at a staged photo call at the Department of National Defence in Ottawa, and took no questions. Defence Minister Jason Kenney and Chief of Defence Staff Tom Lawson faced reporters later. Kenney told his news conference that from the beginning, Canada was interested in doing something in western Ukraine that would maximize the distance from the conflict and minimize the risk Canadian forces would find themselves in a confrontation with the Russian-backed forces in the eastern part of the country. The majority of the trainers, roughly 150 troops, according to the defence minister, likely will be deployed from 2 Canadian Mechanized Brigade Group at Garrison Petawawa. They will be stationed at a facility that Canada helped establish: a NATO training centre in Yavoriv, near the Polish border. Kenney pointed out several times the troops "could not be farther away," as this facility is 1,300 kilometres, or a day's drive, from the current conflict zone. Lawson agreed that the risk is "very low, geographically." 25 troops putting Canada's experience in Afghanistan to use, offering explosives training at Ukraine's Ministry of Defence de-mining centre in Kamyanets-Podilsky in the country's extreme southwest. Between 5 and 10 flight safety trainers from Canada's air force. 5 other troops offering logistical training. The exact locations for the latter four operations have not yet been determined, but would all be in the West as well, "well-separated from recent conflicts," reporters were told. These trainers could be drawn from units across Canada, but are unlikely to include the kind of special forces currently operating in northern Iraq as part of Canada's mission against ISIS. Canada's British and American allies are already conducting training missions in Ukraine. The U.S. has deployed 800 troops to train three — possibly four — battalions in western Ukraine, and the British recently sent 75 soldiers to give instruction in command procedures, tactical intelligence and battlefield first aid. Canada will only be dealing with recognized Ukrainian government forces and not the kind of ad hoc militias that emerged earlier in the conflict, Kenney said. The defence minister said the estimated cost for the first year of the mission would be $16 million, of which $3 million would be a contingency fund to be drawn only if necessary. Because the bulk of the trainers are actually joining a U.S.-led mission, Canada can co-locate at the existing base and save money, Kenney said. DND had previouslyheld back cost estimates for its operations to date in the region. Tuesday's announcement is part of the $578 million in support Canada has provided to Ukraine, ranging from loan commitments to non-lethal military aid and other economic development programs. Canada began offering satellite radar images in March, and is finalizing manufacturing for other military gear, such as high-frequency radios, night vision goggles, medical supplies and explosives disposal equipment. Kenney said Canada's contributions were necessary to "send a strong message of resolution and deterrence" in the face of aggression from Russian President Vladimir Putin. But Canada has "no intention" of making this an accompanying mission, where Canadians would go with their Ukrainian trainees to the front. "This is a non-combat mission," he said, noting the Polish border is "virtually within sight" and it would not be difficult to extract Canada's troops. "If this changes dramatically, we would obviously reassess this deployment," he said. In Rimouski, Que. Tuesday, NDP Leader Tom Mulcair said his party was concerned with the Harper government's "unilateral decision." "This is not something that's even been discussed for one hour in the House of Commons," Mulcair said. "If NATO were to act... that would be one thing, but here this is Canada acting alone," he said, contrasting what's happening now with earlier missions to Mali and Libya, when MPs were consulted. "Stephen Harper won't talk to Parliament... Canadians have every right to be consulted about this," he said. ​Liberal Leader Justin Trudeau called the mission "consistent with Canada's interests and capacities in the world," and told reporters in Oakville, Ont. that Canada had to "make sure that we're doing what we can to help against the unacceptable Russian actions." While the Harper government has lacked transparency and accountability during past missions, Trudeau said he was reassured by Kenney being unequivocal about where the training was taking place and his insistence Canadian forces would not engage Russian troops. Ukraine's chargé d'affaires in Canada, Marko Shevchenko, appeared at Tuesday's press conference to express his gratitude, and said Canada had been a "true friend of Ukraine from the very beginning." He noted that the ceasefire in Ukraine is "still very fragile" and "almost every day, Ukrainian soldiers and civilians continue to die." Both Washington and Ottawa have been under pressure to ship lethal military aid to President Petro Poroshenko's government. Kenney continued to emphasize Tuesday that "all options are on the table." The Pentagon delayed the training program for Ukrainian soldiers last month to avoid giving the Kremlin an excuse to scrap the peace deal struck in February. There have been widespread reports in the last week that Russian-backed separatists are preparing for a spring offensive in the southern region, a sign the conflict could reignite. Mobile users, view a map of Ukraine here.